Definition at line 43 of file Attr.h. Definition at line 78 of file Attr.h. Referenced by clang::ASTImporter::Import_New(), isPackExpansion(), and clang::Sema::propagateDLLAttrToBaseClassTemplate(). Definition at line 86 of file Attr.h. 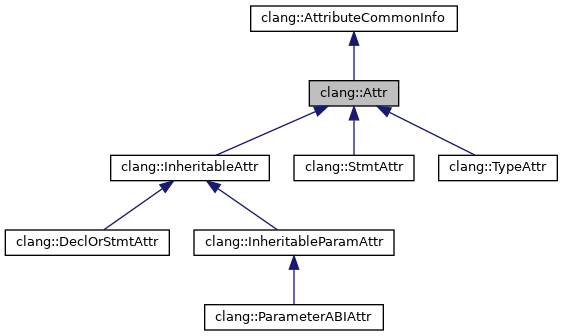 Referenced by clang::ASTRecordWriter::AddAttr(), clang::ast_matchers::AST_MATCHER_P(), attrToRetainOwnershipKind(), clang::TypeAttr::classof(), clang::StmtAttr::classof(), clang::InheritableAttr::classof(), clang::InheritableParamAttr::classof(), clang::ParameterABIAttr::classof(), DeclHasAttr(), clang::ParameterABIAttr::getABI(), getStaticBooleanValue(), handleMSPointerTypeQualifierAttr(), ReferenceDllExportedMembers(), clang::TreeTransform< Derived >::TransformAttr(), clang::attrvisitor::Base< llvm::make_const_ptr, Derived, void, ParamTys... >::Visit(), and clang::TextNodeDumper::Visit(). Definition at line 93 of file Attr.h. Referenced by clang::Sema::ActOnStartOfFunctionDef(), checkForMultipleExportedDefaultConstructors(), clang::TypeLoc::findNullabilityLoc(), clang::Sema::propagateDLLAttrToBaseClassTemplate(), ReferenceDllExportedMembers(), and clang::TreeTransform< Derived >::TransformDependentTemplateSpecializationType(). Definition at line 94 of file Attr.h. Referenced by clang::ASTRecordWriter::AddAttr(), clang::ASTImporter::Import_New(), and clang::TextNodeDumper::Visit(). Referenced by clang::Sema::CheckParmsForFunctionDef(), and getSpellingListIndex(). Definition at line 90 of file Attr.h. Returns true if the attribute has been implicitly created instead of explicitly written by the user. Definition at line 101 of file Attr.h. Definition at line 97 of file Attr.h. Referenced by clang::Decl::addAttr(), ReferenceDllExportedMembers(), and clang::TextNodeDumper::Visit(). Definition at line 110 of file Attr.h. Definition at line 105 of file Attr.h. Definition at line 63 of file Attr.h. Definition at line 73 of file Attr.h. Definition at line 60 of file Attr.h. Definition at line 69 of file Attr.h. Definition at line 102 of file Attr.h. Definition at line 104 of file Attr.h. Definition at line 95 of file Attr.h. Definition at line 54 of file Attr.h. Referenced by isImplicit(), and setImplicit(). Definition at line 52 of file Attr.h. Referenced by isInherited(), and clang::InheritableAttr::setInherited(). Definition at line 58 of file Attr.h. Referenced by clang::InheritableAttr::InheritableAttr(), and clang::InheritableAttr::shouldInheritEvenIfAlreadyPresent(). Definition at line 57 of file Attr.h. Definition at line 53 of file Attr.h. Referenced by isPackExpansion(), and setPackExpansion(). 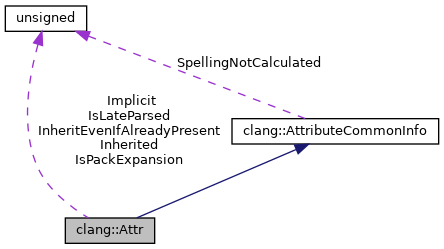 An index into the spelling list of an attribute defined in Attr.td file. Definition at line 51 of file Attr.h.